You may not be able to save the world with just a Swiss Army Knife and a rubber band, but that doesn’t mean you can’t bring MacGyver’s creativity and determination to your daily practice. Be the 80s Action Hero of your yoga class with these MacGyver-inspired tips. 1. Work with what you have. If there’s one thing we can learn from MacGyver, it’s to embrace limitations—and learn to use them to our benefit. Everyone starts a yoga practice with certain limitations. Maybe you’ve never touched your toes, or maybe you can’t hold a balance pose to save your life. 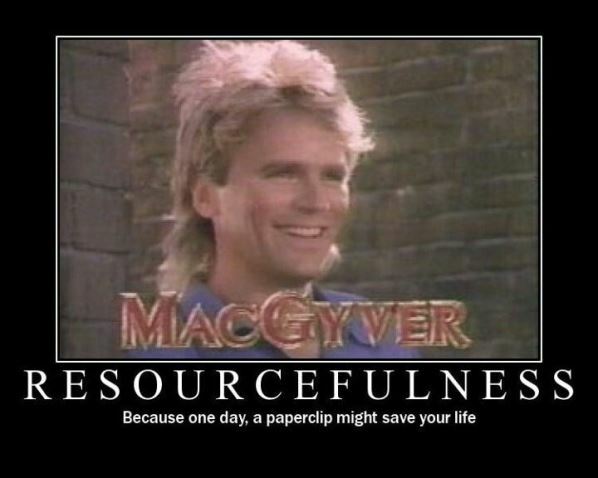 Be like MacGyver and work with your limitations instead of against them. Don’t be too proud to modify poses if you have to, or incorporate props where you need to. Changing your mindset about your limitations might be just what you need to overcome them. Where would MacGyver be if he didn’t pay attention to details? He wouldn’t have made it past Episode One—when he used a chocolate bar to stop a dangerous acid leak—if it weren’t for his expert command of the minutiae. Follow MacGyver’s lead by paying attention to the small details of your yoga practice. Don’t rush into poses just to get them over with. Make sure to pay attention to your alignment, your breath, and the sensations in your body as you move. Keeping these details in mind will help you master even the most difficult poses and keep you safe from injury. 3. DIY yoga props from household items. What do you get when you combine a newspaper, a magnifying glass, and a watch crystal? Not much, unless you’re MacGyver—in which case, you just created a homemade telescope. Combining simple household items is a great way to make the perfect yoga prop that will cost you virtually nothing. Use a scarf or a belt in place of a yoga strap, or substitute a thick dictionary for yoga blocks. Reconsider ordinary objects around the house to MacGyver-ize your yoga practice. One of the reasons everyone loves MacGyver is that he never uses the same trick twice. Whether he needs to scale a wall or melt off zip-tie handcuffs, he’s never afraid to try a bold new strategy to get the job done. In your practice, don’t be afraid to experiment with new styles and techniques. You may love your Vinyasa class, but trying unconventional styles like Aerial Yoga may add a whole new dimension to your yoga. 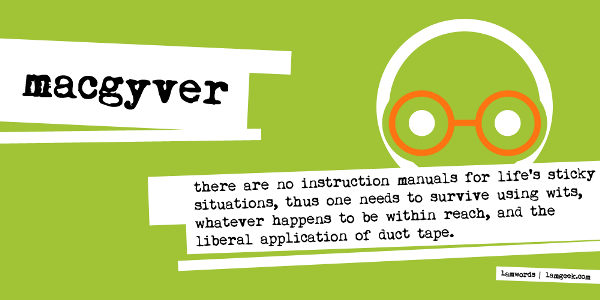 Keep things fresh by channeling MacGyver’s knack for thinking outside the box. 5. Remember that nothing is impossible! 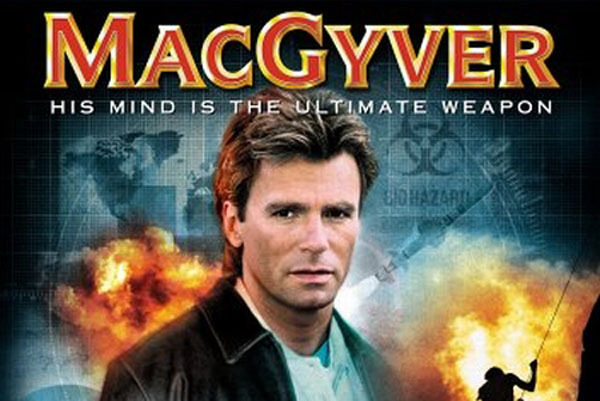 Sure, it may seem impossible to defuse a nuclear bomb with nothing but a Swiss Army knife, but MacGyver never lets a little thing like an “impossible task” slow him down. 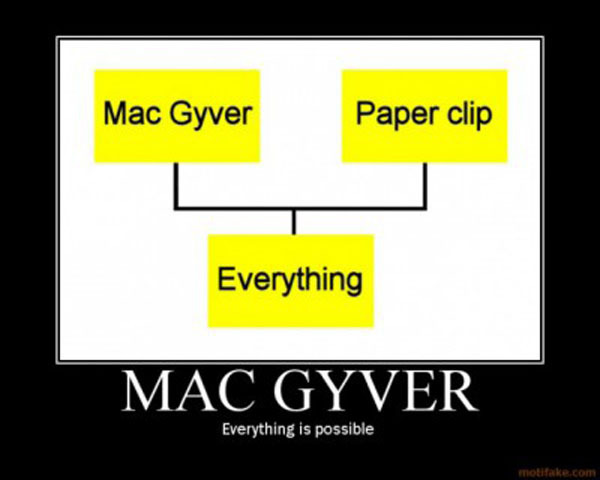 The true secret to MacGyver’s success is his belief that absolutely anything is possible. Next time you feel like you’ll never master that impossible pose, just remember the time MacGyver parachuted a car full of diamonds from a moving airplane. If he could make something as crazy as that work, you can master any yoga challenge you set for yourself. 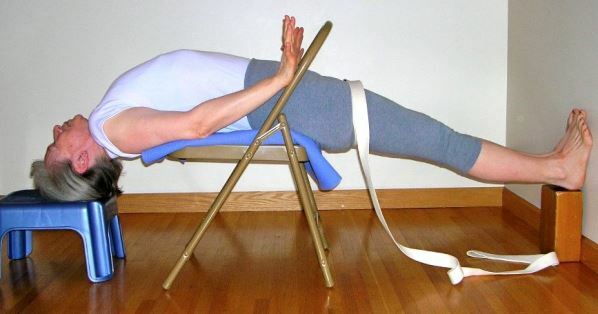 Got any other tips on how to MacGyverize your yoga practice? Share them with us!